Brown, K. (2017). Accommodations and support services for students with autism spectrum disorder: A national survey of disability resource providers. 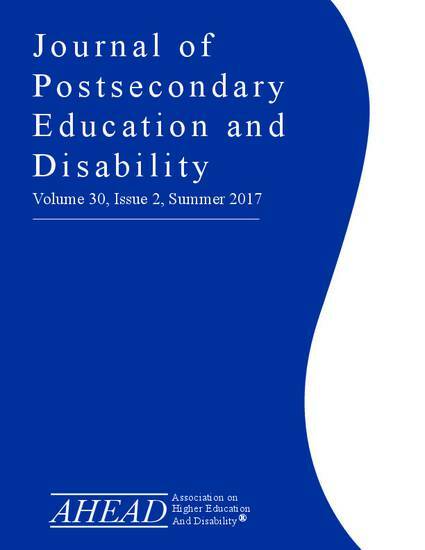 Journal of Postsecondary Education and Disability, 30(2), 141-156. Students with Autism Spectrum Disorder (ASD) are participating in postsecondary education at an increasing rate. Yet, we know little about what types of accommodations or services disability resource providers employ to support students with ASD. The purpose of this study was to examine how postsecondary institutions are fostering the academic success of students with ASD. Using a randomly selected, nationally representative sample of postsecondary institutions (n =1,245 response rate 38.8%; return rate 41.9%), this study explored enrollment trends of students with ASD and the types of reasonable accommodations and support services offered to those students. This study used predictive modeling to isolate factors that are strong indicators of whether or not and institution provided ASD-specific programs. Findings indicate that although students with ASD are more likely to attend two-year public institutions, there are no differences in accommodations or student support services by institution type. Over 90% of institutions use academically focused accommodations (e.g., extended exam time), but only 44.7% of institutions provided sensory accommodations and 28.3% of institutions offered ASD-specific services. The existence of peer mentoring programs was the strongest predictor of whether or not an institution had ASD-specific services. Implications for practitioners working in postsecondary environments and future research are discussed.